In 1967 a number of artists in Rome formed the arte povera group, with Jannis Kounellis as one of the key members. Literally the name derived from their use of poor and often discarded industrial materials rather than the traditional use of expensive oil paint, bronze or marble. This is something that they had in common with American minimalists but beyond the use of found materials they could not have been more different. The Americans were anxious to differentiate themselves from European traditions by eschewing all references beyond the physical qualities of the material. This was a logical extension of Clement Greenberg’s vision of autonomous art objects that are what you see – no more, no less. The arte povera artists on the contrary filled their work with poetic references to history and mythology, and very commonly to the relationship between nature and culture. Kounellis’ ‘Untitled 1984/87’ is one of his most important works and it includes many of the ideas that permeate his art and arte povera as a whole.1 The work has a clear narrative that moves from left to right. The burning gas flame on the left represents the transformative power of fire and has alchemical associations.2 Literally it is the element that changes the physical state of materials from solid to liquid to gas and can be used to represent passage from material to spiritual and the cycle of life and death. The flame is attached to a bed frame, which is formed to exactly fit a sleeping body. It is the place where we are conceived and born, where we dream, where we make love and with luck where we die. So far then we have a story about human life; next we find fragments of household furniture, a house beam and bundles of objects wrapped in pieces of grey blanket. The domestic and the traveller are invoked: two aspects of our life and our journey through it. In the centre of the work is a matt black square, a direct reference to Kasimir Malevich, an artist Kounellis admires greatly.3 The suprematist ‘Black square’ 1915 in Malevich’s terms contained opposites, in the form of a nihilistic statement about the end of representation and at the same time a window onto infinity and a space for meditation. In late modern art this emblematic square invariably suggests transcendence or the often wistful acknowledgment of its impossibility. Kounellis also admired Yves Klein, and like Klein he was interested in the idea of an immaterial void or spiritual dimension to which humanity might aspire. The symbolism of fire in transforming matter is related to this quest. 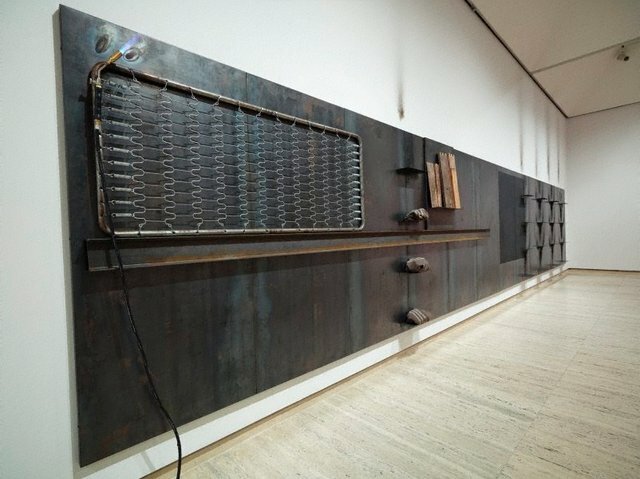 The remainder of the panels are filled with orderly rows of shelves, above each of which is a sooty trace of fire. In the port city of Piraeus (near Kounellis’ birthplace) is a cemetery where oil lamps burn on each grave as a token of the passage of the spirit, and it is reasonable to assume that this is the meaning Kounellis wants us to take from the work. This is the end of the story but perhaps the fire at the left of the work speaks of a new beginning. 1. This work was first reserved by the AGNSW in 1986, when it was displayed at Anthony d’Offay Gallery in its 1984 version.